Of the many questions I receive each year, most are about how to do basic things. How to feed, how to split, how to prepare for winter. Each of these is an important question, and each deserves a careful answer. But what I consider the most difficult aspect of beekeeping is seldom mentioned. It is the thing that experienced beekeepers know intuitively and that new beekeepers totally miss. It’s the reason second-year beekeepers know everything, and 20-year beekeepers wish they knew more. And it’s the thing that can make or break a colony. This knowledge comes in bits and pieces. Even after many years, I have moments of clarity, aha moments when I suddenly understand something new. Each time, I wonder why I never saw it before. The skill I’m talking about is the ability to understand and anticipate what is going on inside a hive, to know it before it happens. 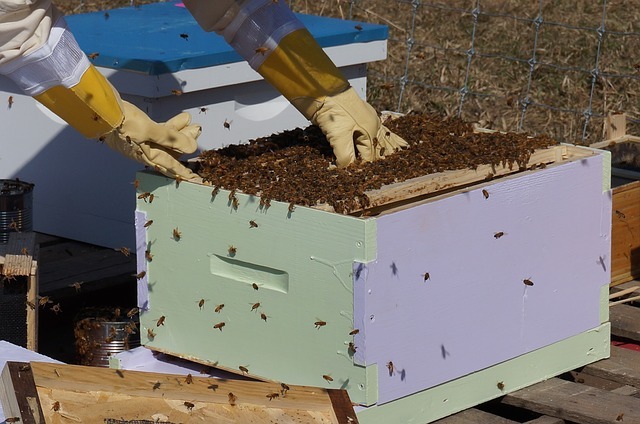 To develop that skill, a beekeeper needs a solid knowledge of the lifestyles and life cycles of everything that lives in the hive, including bees, mites, beetles, moths, and pathogens. And on top of that, the beekeeper needs to develop a feel for his local environment, including weather patterns, bloom times, drought cycles, and pesticide use. As beginners, we rely on what we see or what we don’t see. But the experienced beekeeper relies on what he knows will happen next, long before he sees it. When we rely solely on what we see, we are often too late. For example, many beekeepers report that they have no mite problem because they’ve never seen a mite on a bee. They’ve looked and looked. This is understandable, especially since we see so many spectacular mite-on-bee photos in books and on the Internet. But those photos are remarkable because they are unusual. Personally, I’ve tried for years to get a good photo of a mite latched onto a bee, but I can never find one. Does that mean my bees don’t have mites? I wish. Another example is robbing. A new beekeeper often waits until he sees robbing, and then tries to stop it. An experienced keeper knows when conditions are ripe for robbing, and he takes preventive measures. Like predicting the weather, the forecasts are not perfect, but they are accurate enough to be useful. A third example is supplemental feeding. If bees need winter feed, a beginner gets accustomed to the rate of winter food consumption and imagines it will hold steady. The experienced keeper realizes that the rate will increase dramatically in late winter/early spring and he must be ready. Although I hate to admit it, I still make this mistake on occasion. How can I be so short-sighted? Fourth, it takes a long time for beekeepers to understand that, basically, colonies grow for six months and contract for six months. On a hot sultry August afternoon, it’s hard to comprehend that your bees are getting ready for winter. The idea is at odds with what you see, which is a booming colony blackening the sky near the hive. Likewise, it is hard to realize that a quiet snow-covered hive on a 20-degree day in February is actively preparing for spring. I could go on with dozens of examples, but you get the point. It’s often been said that beekeeping requires little time, but the things we do must be done on time. Anticipation is the trick that allows you to accomplish things on time. Assuming anticipation is the hardest thing to master, how can we help new beekeepers? The truth is, I don’t know. Some people are more intuitive than others and pick it up faster. Others prefer to stick with the recipe method and seek specific directions on what to do and when to do it. We all learn in different ways and our moments of clarity are triggered by different events. I imagine the first thing a new race car driver wants to do is drive. Fast. But the good ones, the ones who persist, are those who understand how their car works. They know every last detail and how the system can fail. Similarly, the first thing a new beekeeper wants to do is keep bees and harvest honey. But the good ones, the ones who persist, are those who understand how their bees work. They know every last detail and how the system can fail. When I look back on my own history, I learned the least from the how-to books, and the most from the honey bee biology books. This may surprise you, but the second biggest leap in my beekeeping knowledge occurred when I began studying bees other than honey bees. In fact, when I speak to beekeeping groups, I love to compare and contrast honey bees to the many other bee species. Honey bees have many, many things in common with other bees but at the same time they are the outliers, a truly unique member of an incredibly diverse group. Understanding how similar honey bees are to other bees provides a basis for understanding how different they are as well. As you study other bees, you soon begin to see how honey bees have misinformed our culture about bees in general. A statement like “male bees die after mating” has to be qualified since it is only true of honey bees. Similarly, “bees die after stinging” has to be qualified because that, too, is only true of honey bees. And swarming? Swarming as we define it is definitely a honey bee thing. Studying other bees helped me understand the unique attributes of honey bees and how they work. At the same time, it became obvious that honey bees are just one small part of an enormous plant/pollinator system. Honey bees can’t be understood in a vacuum; they have to be studied in the context of their environment, and that environment is complex with many variables, including lots of other bees. So the take-home message, the advice I would give to new beekeepers, is to start with a how-to book because this will allow you to set up your hive and get started. But as soon as possible, move on to honey bee biology. At the same time, become aware of other bees in your environment. If nothing else, learn how to distinguish a bee from a wasp. Does that sound too easy? You might be surprised. The differences between the two help clarify what makes a bee a bee. Once you know that, you can begin to understand what makes a honey bee different from the other bees, and why she is so special. My goal here has always been to encompass all bees, not just honey bees. But it is easy to get distracted by honey bees because they are fascinating, because beekeepers have lots of questions, and because the word “bee” has become virtually synonymous with “honey bee” in our culture. Perhaps I’m over-thinking this, but I sincerely believe that the more you learn about all bees, the more your beekeeping skills will grow. The hardest part of beekeeping is knowing what your bees will do before they do it. Pixabay photo. I guess that is why honey bee biology is studied in each of the three levels of the Master Beekeeping course from the University of Montana. After finishing the Masters section, I finally get it. I was not so interested in it before, but now it is kind of interesting. Now I need to branch off and learn about other bees. I do now notice these little creatures, but only because of your posts. Thanks Rusty! In my first year as a beekeeper, what amazed me is how there are only small windows where you can really do certain tasks. I had a sudden insight into agriculture, where life is seasonal and if you miss it you have to wait until next year. The same seems to be true of beekeeping. Now in my second year, there are a number of tasks I missed (like late-summer feeding) that created challenges going into winter. Your post is so spot on! I hope to be a better beekeeper next year by anticipating what the bees are doing ahead of time. I find bee biology fascinating, especially as scientists are constantly making new discoveries. There’s still so much to find out. Really useful article thank you Rusty. I’m a ‘second year’ so your words rung very true for me. Rusty, I always enjoy your posts – thank you. I have been working my way through the bbka modules and was just thinking the other day that I can’t see my how-to books for biology books. I started studying the modules to bolster my theory knowledge which does make such a difference in making practical decisions when out in the apiary as I am more thoughtful of what the bees are doing, what they need and how I can help them best. I haven’t looked at other bees and wasps yet so was interested to read your account of how they differ. I shall look forward to learning more (in my next module). Rusty, please recommend a good book for bee biology. I finally wrote a small list of books in today’s post. You weren’t the only one who asked. Thank you so much for this insightful and wise article. I have shared it to our bee club Facebook page. I think the knowledge that you have provided here needs to be shared over and over again. Learn all you can, before you dive in. Don’t assume you know everything, because in beekeeping, you never will. The bees will teach you, learn to listen and watch. Bee humble and accept your mistakes and failures. You really will find it hard to beat Kinaesthetic (Kinesthetic in the US) learning when it comes to bee keeping. Hands on learning, experience and learning from ones mistakes are priceless. However, if new to the “sport” and without a mentor, or at least someone experienced that is only a phone call away, it can be a very mysterious first year for some. This is why I believe all prospective keepers should be “keepers” for a year (or at the least the winter) before actually obtaining any bees. Use this time to study the theoretical side, read, read and then read some more. Gather up the hardware, tools and clothing needed for say three colonies. Then read some more. Read recommended titles from trusted sources. Read volumes that have survived the ages, like the Dadant Publication line, especially “The Hive and the Honey Bee”, I believe all keepers should have a copy of this on hand, regardless of their hive of choice, or their particular management strategy. Reading/watching the Internet is fraught with personal views and some dubious advice at times, but if you are reading this, then you have already found an invaluable source of information and one of the best, well written blogs out there. Use the search feature and read the archives, the answer to many a question will be within this very realm. Then, go get your bees. Armed with a bit of theory will make it a much more relaxed, less harrowing experience as you learn through the first season of keeping bees. Better yet, find a trusted mentor close to where you will be keeping your bees! But, to heck with the basics and the biology–both are splendid subjects that I am still learning and doubt very much I will ever know all there is to know, but I want to know where one can study bee psychology? Crack that nut and a whole lot of things might get a heck of a lot easier to not only predict, but understand! Thank you for the nice compliment, Jeff. I’ve done a little bit of studying into the biology, but after reading your post I would love to dive a little deeper. Do you have any recommendations of specific books that would be good for me to look at? Fantastic post, Rusty. A must read for any new beekeeper, or anyone contemplating becoming a beekeeper. I’ve tried and failed for years to make similar points in an easy-to-follow manner. Thanks. And it’s really good to hear from you!